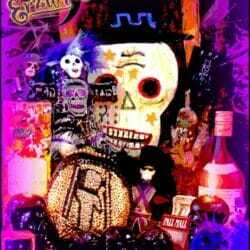 Voodoo Spells & Love Spells Altar Pieces and Objects D’Art Vodou . Jewel Encrusted Series of Gemstone Sacred Hearts. 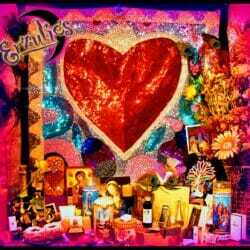 Jeweled Voodoo Sacred Heart Altar Items and Gemstone Voodoo Hearts for Erzulie-Freda, the Spirit of Love. Exclusively at Erzulie’s Voodoo in New Orleans. 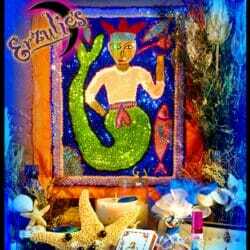 The second in a series of exquisite, handcrafted jewel encrusted Vodou Altar pieces & obscure precious gemstone Vodou Fetishes exclusively at Erzulie’s! 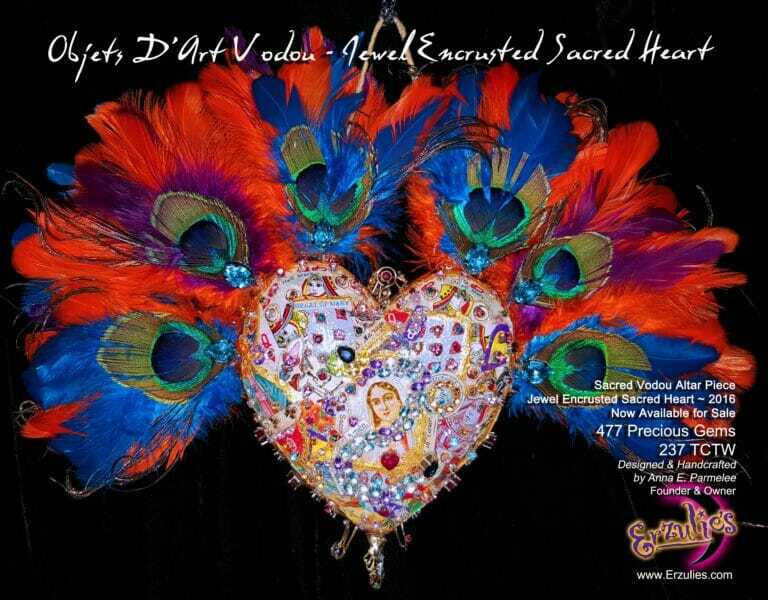 This unique, precious gemstone encrusted sacred heart was created, designed & handcrafted by the Root Queen personally, as inspired by the Lwa (Divine Vodou Spirits) and now available for sale. The feather plume crown was handcrafted using ostrich and peacock feather plumes, topaz stones and double-sided in contrapuntal colors of blues and oranges with checkerboard placement. The vintage hat pins in the center of the top are 14k gold with rubies, pearls, emeralds, diamonds and other precious gemstones and sourced from sacred places around the world. The handing pieces at the bottom on diamond encrusted peacock earrings and vintage jeweled hat pins set in scrolled 14k to 18k gold. “Jeweled Sacred Heart” for Erzulie-Freda ~ 2016 Sacred Vodou Altar Piece weighs approximately 2 pounds and measures 10” H x 7” W x 3” D for a stunning, one of kind altar piece with top loop to hang over your altar so it can display on both sides, or for your precious art collection. This altar piece ships in a gift box, signed and dated.